People always say that you shouldn’t try to make too many significant changes in your life, at the same time. My experiences, have consistently been the opposite. When I started a new Job, 5 months ago, I committed to losing some weight. I comfortably lost a stone in the first 8 weeks (all of this going on, while adjusting to a new company, new working hours, new systems etc). I’ve managed to maintain my weight at this level, through sensible balance, and lifestyle choices. The next step now, is to get physically fit. I’m not convinced, £40 per month in gym membership would give me value for money. That cash (if I had it) would be better spent saving for a holiday. Instead, I have worked out a route around town, that’s about 4 miles, and I run it 3 to 4 times per week. Will I be able to keep it up through the cold winter nights ?. Well, I’ll let you know what happens. I set myself 2 cookery goals per month. This month, it’s Steak, and Beef and Guinness Pie. The idea is that I buy the ingredients, invite a friend around, and then cook the meal and get them to tell me what they think. Just like my work in technology, the emphasis is on certainty. Too many people in my opinion, use the word “know” when they actually mean “reckon”. When I say that I can cook a vegetarian curry, that doesn’t mean I’ve seen it in a book and can probably do it, that means I’ve prepared it, cooked it and eaten it, alongside one of my friends. 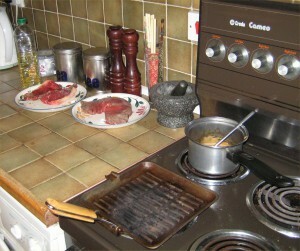 That way, if I need to cook that dish again, I have the confidence of knowing, I’ve tried it and succeeded. I decided to cook Steak first (The pies are being cooked on the 26th, if anyone is nearby) and invite my old mate Glenn, who I know, likes Steak. I took my experimentation further, by purchasing different steaks, to see if there really is a difference (I normally eat my steak well done, and people have said there’s no point in buying expensive stuff for that. I wanted to test it). I bought a Tesco finest organic steak for Glenn. Nearly half a pound, Sirloin. I bought myself 4 pieces of Rump Steak, from Iceland. Roughly the same weight, both steak “items” cost about the same. I’m ambitious in the kitchen, but the key here, is to be realistic. I decided not to try and make my own peppercorn sauce, so I bought that in. 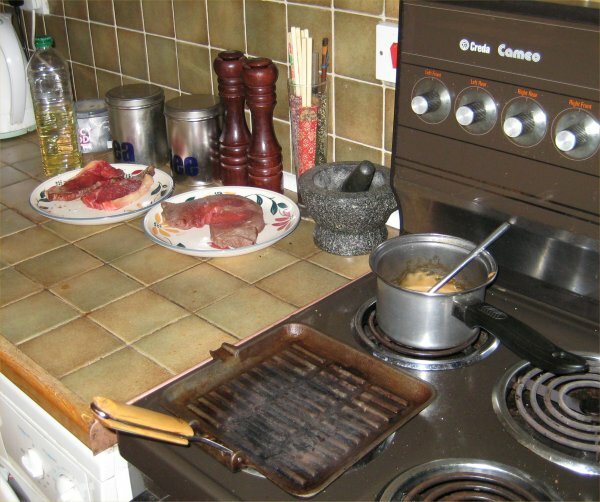 The other novel thing, was I decide to cook the steaks on a grill pan, to make the cookery sort of “interactive”, so Glenn could get involved, and get his steak cooked the way he wanted it, rather than me bringing it in, the way I thought he wanted it. I learned a really cool way, to steam vegetables in a microwave oven. Served with the Steak, and off we go. Like any good guest, Glenn, bought a bottle of Red (I don’t believe in God, but if he is real, I believe that he made Red wine, to be drunk while eating steak). So, was it a success. Glenn told me he enjoyed, it, and since he’s the guest, that’s good enough for me. What do I think ? I enjoyed my steak, but 2 crows don’t make an eagle, and loads of cheap steak, is no match for 1 big piece of quality meat. Lesson learned, and thanks to Glenn, for coming over. Tables, Internet and the Cold war. 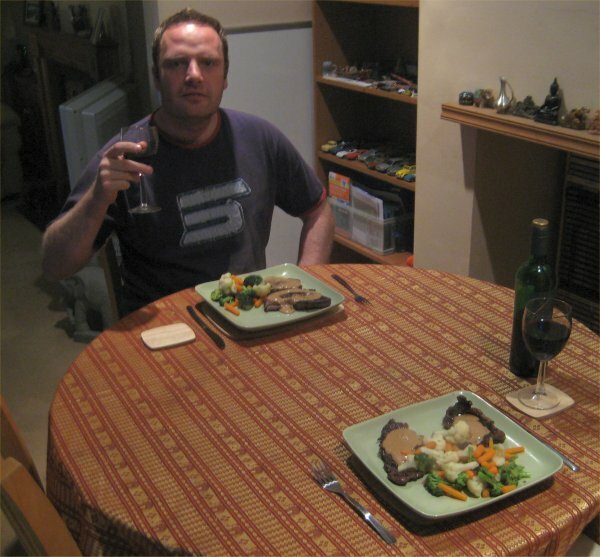 The picture above, shows the original table cloth, that I bought in Thailand, a couple of years ago. I do quite a lot of work on the dining table (not when people are actually eating on it) and I decided that a blue cotton one, would be better for day to day use, so I bought one on Saturday. . I wasn’t sure whether/how to, iron the table cloth, so I google’d “iron a table cloth”. A host of websites appeared (I love the way Google lists as you type now, its awesome). 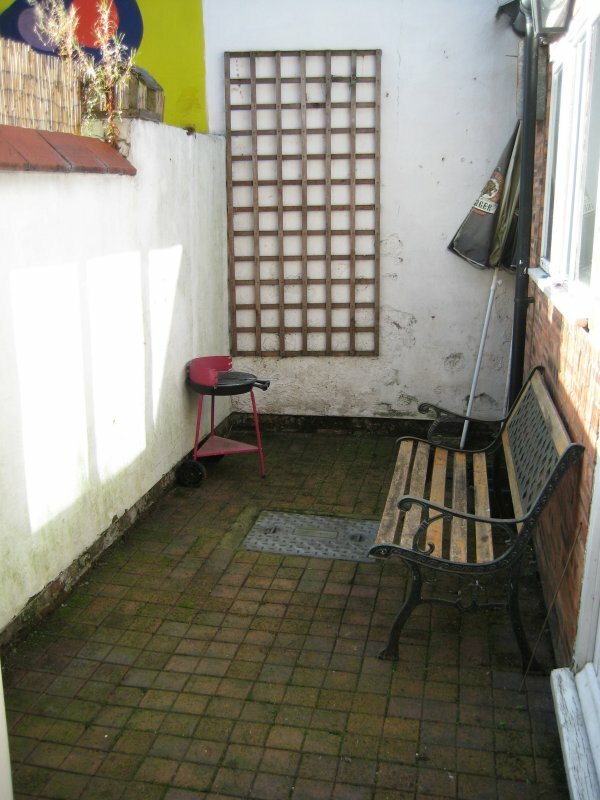 I picked one called how to, and it gave loads of useful advice, and cloth and table, were as one, on not time. I also washed some curtains. I wasn’t sure how to Iron them, so tried a similar google. Completely different this time, I get extensive listings on the Cold war, Churchills speach, Gobachev, etc. Made me smile. I suppose that’s what you get when you google “iron curtain”. I’ve been using freegle for a couple of weeks (Its the new name for free-cycle) I was trying to get a 3 seater sofa, to replace the 2 seater one I have (in truth, I really miss lying down and watching TV). You post, either with things you want to give away, or things you are offering. The basic idea is that you help the environment and improve the local community, by offering things you don’t need to people. That way contents of landfills are reduced and things like prams, which only have certain life span in a home, are passed around for the better good of all. I havent seen any sofa’s, but some people have actually posted, asking for play stations 3’s and cars, which I think is a bit deluded. One thing did inspire me. There’s a guy on there, who gets collects computer parts. He then builds them into fully working computers, which he gives away for nothing. He has just built his 264th !. I read recently about Rebecca Javeleau, the 14 year old girl, who invited 15 people to her birthday party, but made the group public and ended up getting 21,000 invites. The police said, they would station officers outside the house, for increased security. Okay she should have been more careful with her details, but will some psycho really turn up at the house. From the books I’ve read on sociopathy its more likely, someone will just pick a house at random, or visit somewhere because he thinks god is speaking to him through the radio !. White Collar, True Blood and Eureka have all just finished in the US. This week, House, Special Victims Unit (final series), Fringe, Stargate Universe and Dexter all start new series. Spooks season 9 opened on BBC 1 the other evening, and it was pretty good. I have previously wondered how long they can drag out the same stuff, but this series seems quite good. After recommendations from a friend, I watched the girl with the dragon tattoo. If you haven’t seen it, it really is excelent. Its tense and gritty with a very clever story. I couldn’t even guess who the killer was until the very end, which is quite unusual for me. Overall, brilliant. On Saturday, I went to the cinema to see the sequel, the girl who played with fire. What happened ?.Same characters, same actors, but this film had lost everything from the original. Characters, you previously struggled to fathom, become transparent. A series of co-incidences, that challenged even my imagination, and a villain, who was right out of James Bond. No tension throughout the whole film and a “hero gets the girl ending” finished me off. I hope the 3rd part is better. Apparently, the first film is being re-made in Hollywood, so that will be even worse. Winter is coming, and Sundays walk was cold and embittered with rain. But no problem, we perused the map and off we went. 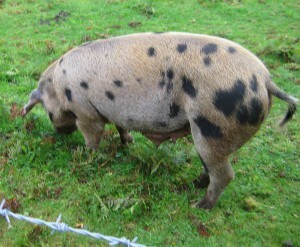 Amelia came along this weekend, and we met up with Tone at Helsby. A quick walk up Helsby hill and a pause to enjoy the view. 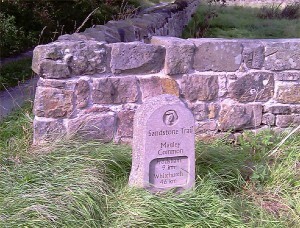 Back down the other side, we had through a series of paths, then wander up the hill. Near the top of the hill, this futuristic house, called Stepping stones. 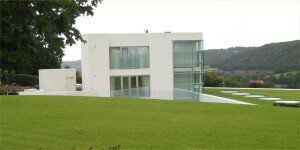 Half of the house is underground. I wasn’t sure about photographing it, as it’s someone’s home, but its an amazing building as well, so I thought a photograph from this angle was a reasonable compromise. Further along we head out into the hills, then follow the 5 miles back into Frodsham, along the Edisbury way. The path hadn’t been walked in a while, and you can see from this cornfield, we had to “Borneo” our way through sections of it. Back at Frodsham, a pint in the Helter Skelter, and then train home. I heard from an old friend, Kath Ladensowski recently. Turns out, like many of my other friends, she has set up her own business Aster Accountants. 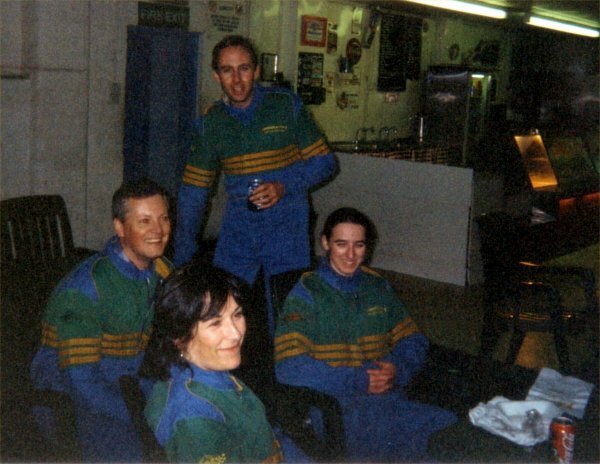 Kath and I worked at Morris & Co some years ago, and I dug out this picture of a team event, Go Karting (just to show that its a small world, this picture was actually taken about 300 metres from where I now work). Tone and I are off back to Horton on Ribblesdale on the 1st of October. We’ve rented a car (only £42 for 3 days ! ), and I’ve taken the friday off work. I’m quite looking forward to it, as I’ll get to see my uncle John, who I dont see very often (he lives there). We are also meeting up with some of Tony’s friends from Social circles. Aside from money and time, one of the key challenges of organising trips and adventures, is find a ready supply of adventure ready people. I’m quite looking forward to meeting them. 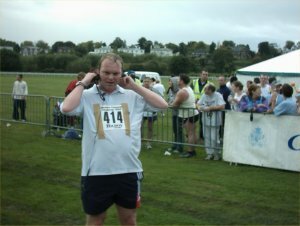 I’m pretty fit, but I haven’t done the 3 peaks in 5 years and I’m now in my 40’s. I’m sure I’ll be able to do it, as I’ve said before to climb mountains, you need fitness and an unwillingness to quit. If I could only have one, it would be the 2nd. I’ve done some overtime this month, so I’ll also be booking flights to Budapest in October. Okay, its not massive international travel on the scale I’ve done in recent years, but I didn’t want to go a whole year without getting on a plane. I’m researching the trip at the moment, so I should have a full list of things to do and see. 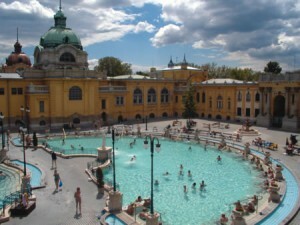 If you’ve been there, and have a recommendation for the city, post bellow. First of all, apologies for the delay putting up this weeks pages. I have worked the past 2 weekends (but I have this Friday off, so it should all balance out). 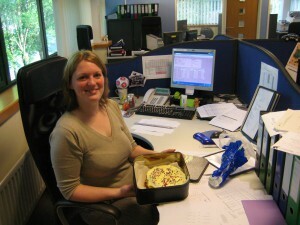 Congratulations to a close colleague and friend, Lyndsay, who celebrated her birthday last week. Not only did Lyndsay go to Oxford, maintain a significant role in the accounts department, is captain of a sports team and qualifying as an accountant, but she can also bake (as you can see from the delicious cake, featured in this picture). From everyone here at johnsunter.com (which these days, is basically, me) happy birthday. 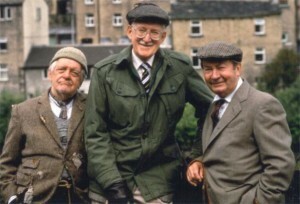 Final episode of Last of the summer wine (whine ???). 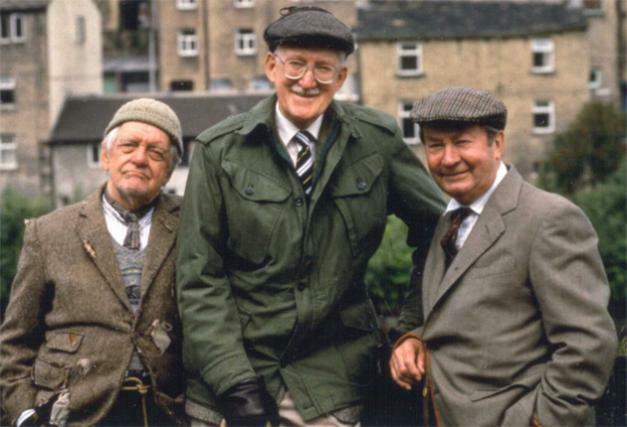 On the subject of time passing, the final episode of Last of the summer wine aired recently. I just wish I could find the people who made this rubbish, and find out what was going through their minds ?. No actually, I wouldn’t like to speak to them. In silence, I would like to load them all onto a bus and then drive it of a cliff. The loss of my own life, would be a small price to pay, to rid the world of these media criminals. In a perverse way, I actually prefer the hated Big Brother. At least they are trying to do something modern and different (though failing miserably). Simplified life. The joy of a small garden. A lot of people are critical of my garden. 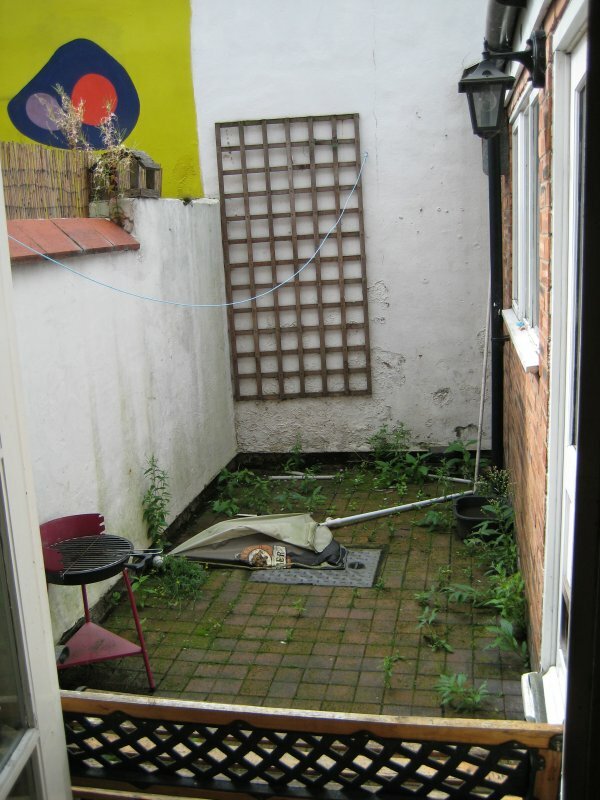 They say unkind things, like “it isn’t really a garden at all” or “why don’t you cover over the windows on your back door, so you can’t see that thing”. Well, I’m quite fond of my garden (despite the fact that its a bit noisy, because of the generators used by the Mill Hotel). I have spent many years, trying to simplify my life in as many ways as possible. My garden has one additional advantage. Take a look, at the picture above. Now look at the picture bellow. 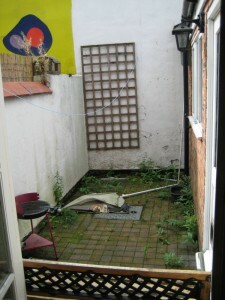 I think you’ll agree, that in this picture, the garden is a lot tidier. It took me 25 minutes to maintain my garden, after 4 months of neglect. 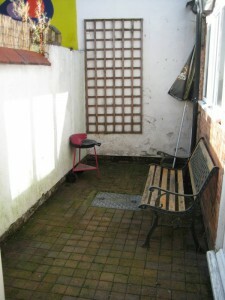 Can you sort out your garden more quickly ?. 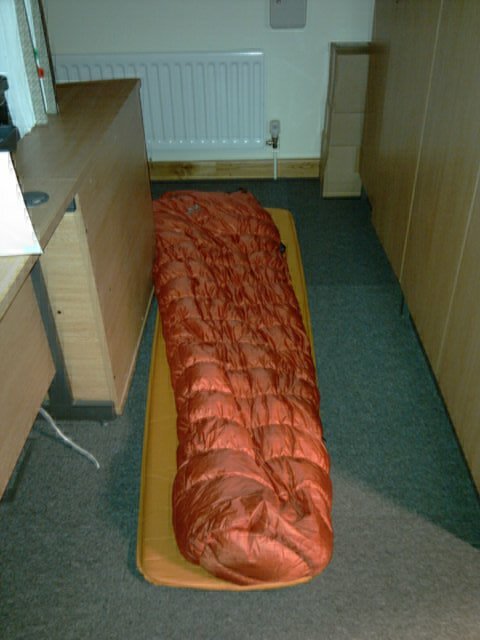 The cost of good outdoor gear, is never wasted. I recently had to work the bank holiday. It involved coming into work early on a Sunday morning (6am). Although the Government, constantly bang on about the environment and public transport, sometimes, they just don’t provide an alternative. In this instance, the first train to Warrington from Chester, would have got me there at 9:30am !. No good at all. I decided to sleep over the night before. I set up my bed rig as you can see above. I also got some microwave pizza’s for supper, and relaxed watching the Sopranos on my laptop, before retiring to “bed”. I was up bright and early, and everything went to plan. Unfortunately, it has been pointed out, that the building isn’t insured for tenancy, and it wasn’t the cleverest thing I’ve ever done. Obviously I’ve promised not to do it again. Talking of trains. I got up last Saturday, to get the 6:13am train (yes, 6:13am). I was standing on the platform, and it was cancelled. Can you imagine how annoying that was ?. Well, we’ve been out and about walking again. The weekend before last, we did a circular walk around Frodsham, to find the source of the Manchester Ship Canal. 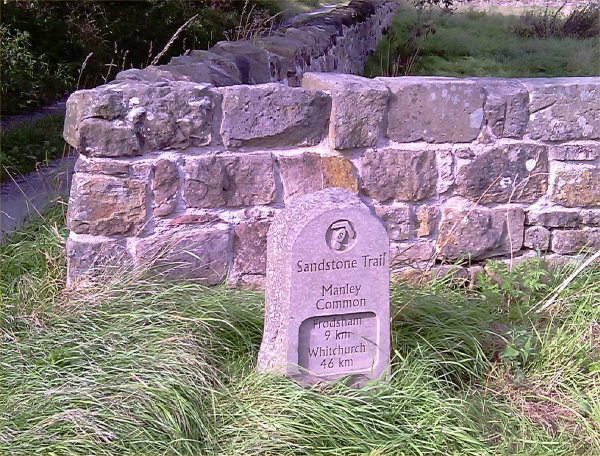 Last weekend, we walked from Frodsham to Delamere forest, along the Sandstone Trail route, I walked some years ago, with Frank. 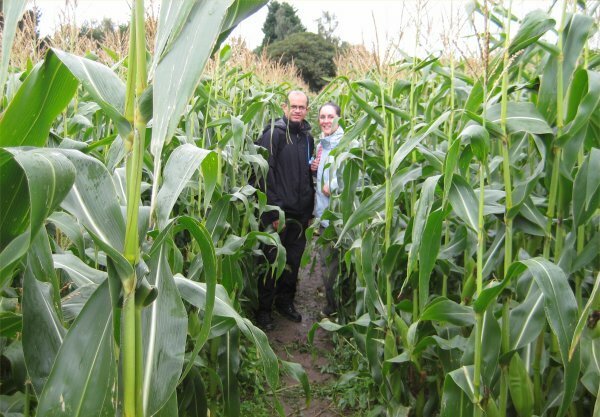 We usually wrap up a walk, with a couple of pints in the Helter Skelter pub in Frodsham (that’s if the walk actually ends in Frodsham 🙂 A lot of the other walkers and cyclists there, sport beards, and for a brief time (about 3/8ths of a second to be exact) I considered growing one myself. I occasionally wander around Warrington at lunch-time. Some people are a bit snobby when it comes to visiting places like Pound World. I popped in the other day, and got a superb luggage scales, which I’ve wanted for ages. I nearly paid £15 for some in Capetown airport, so you can imagine my delight at getting exactly what I wanted, for a £. If you get a minute, read Simon Calder’s website. It really is excellent. Unusual surprise about Newton Heath. 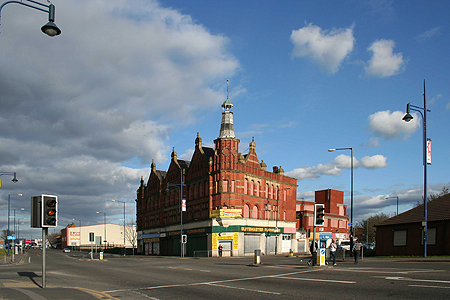 While growing up, I lived in a place called Newton Heath, in East Manchester. I don’t like to do the place down, but lets just say, with the exception of a few close friends (who have mostly moved out themselves) I’m not sad that I don’t live there anymore. Everyone knows, that Man United’s original name was Newton Heath football club, and played at the Loco (pretty much 100 metres behind where this photo was taken). What I didn’t realise, was the number of interesting and famous people (in addition to myself) that came from there. Mike Atherton – Famous cricketer and OBE, actually went to Briscoe lane school. Alfred Morris – Barron of Manchester. I didn’t even know that Manchester had a Barron ! Sir Harold Matthew Evans – Former editor of the Times. Judy Finnigan – born and brought up on Amos avenue, where I delivered papers. Mather and Platt the international engineering company (now owned by Germans) was founded here. Okay, its not exactly Who’s Who, but its a lot more inspiring than I had expected. 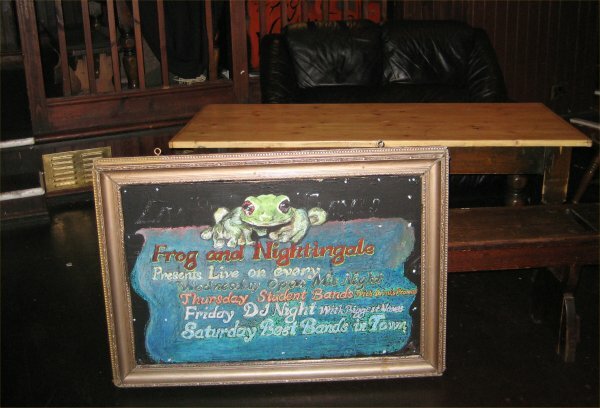 The Frog and Nightingale, my local pub for the last 8 years closed last night. It was quite a sad moment for me, as I have had loads of really good times there. Nearly all of my old friends have moved out of the City/County/Country. 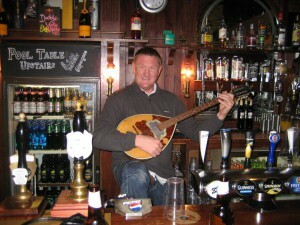 I’m the last of the 20 odd of us, who used to congregate in the Firkin, that was later renamed the Frog and Nightingale. Most pubs in Chester have seen takings drop by around 30% over the last year. Things have never really recovered from the smoking ban. A poor summer and dirt cheap alcohol at places like Tesco, have all contributed to the demise of the local pub. 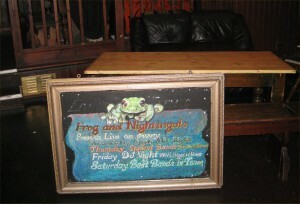 Rumours had been spreading for a while, that something was happening at the Frog and Nightingale. I don’t go out that often now, but realising it might be my last chance to enjoy a pint there, I popped over on Sunday evening. 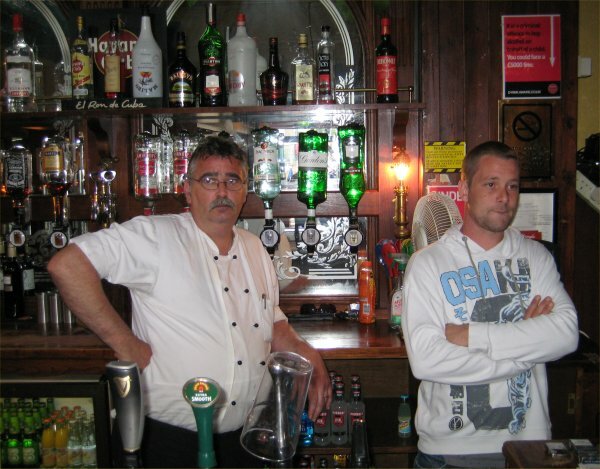 The faces of the staff, when I got there said it all. A large group of Polish business people arrived and sat oblivious to the impending doom (it was quite a surreal moment). Tony the landlord arrived, and things picked up a bit. It was sad in one way, but we/I have always known that nothing lasts for ever, and with that thought a sort of party atmosphere descended on the place. Free drinks were evenly distributed, loads of the old staff turned up, including Jude, Nathan and Kev. All sorts of memorabilia was collected, and various old guitars were removed from the wall. I grabbed this picture, which my friend Bilge painted. Its hung on the wall outside for about 5 months, in rain and hail, and the picture hasn’t run or been tarnished in all that time. It’s a good metaphor for the pub itself I suppose. You can read a bit more about the Frog here. 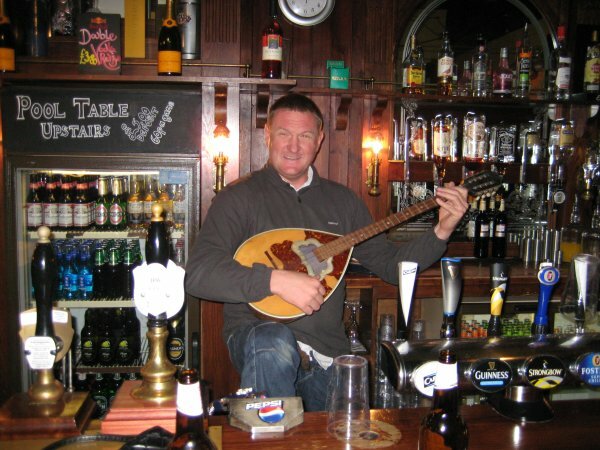 Trying to find a nice pub, that’s friendly but not poncy, is going to be difficult.